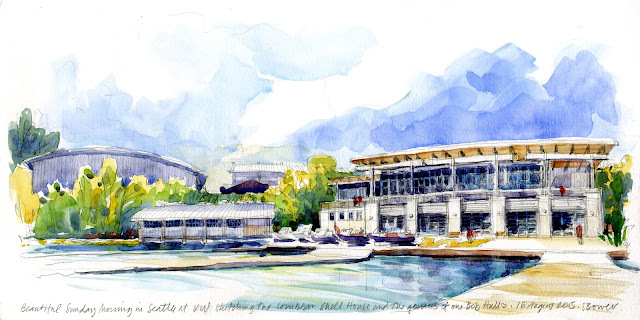 I was so happy this morning to once again join Seattle Urban Sketchers on the waterfront at the University of Washington Seattle campus! A beautiful, sunny summer day, I sketched the Conibear Shell House designed by amazing architect and friend Bob Hull. As I sat and counted bays, counted windows, studied the relationships of various elements (drawing something makes you look so closely! ), I felt as if I could see Bob's design intent and understand a bit of his genius. Then off to Asia for the wonderful and once again incredibly well-organized Urban Sketchers symposium in Singapore (where I also gave a lecture on perspective and got to sketch with such talented folks--thank you to the Australian contingent for adopting me! ), followed by true adventure sketching with a dream team in Cambodia at Angkor Wat, ending with 5 days in Bangkok, Thailand. I am so grateful to have these incredible opportunities to travel and learn about what I see through sketching. Lots of sketches to follow here and on my flickr page and blog too.